The Oldsmar Ceiling Contractor that specializes in Popcorn Ceiling Removal, Popcorn Ceiling Repair, Drywall Repair, and Texture Ceilings and Walls includes a talented group of ceiling experts in the Oldsmar Florida area who offer nothing less than the best in services. If you are interested in texturing your ceilings and walls or popcorn ceiling repair, our talented professionals will provide you with a flawless finish. Most Oldsmar Florida homes incorporate unique textures into the wall patterns, and our experienced ceiling specialists have mastered the techniques required to match existing textures that are in your Oldmar home. Our specialties include orange peel, skip trowel, knock down and other popular hand texture methods. We can finish the job with custom paint. Updating unattractive popcorn ceilings to a more modern appearance is our specialty. If you are considering having your ceilings textured but are afraid of the mess, inconvenience or expense, don't even think twice about it. We offer a fast and reliable service and we take pride in our work. Hire someone based on track record, and your gut feeling as well as cost. Since you'll be working with this person and giving them access to your home, you'd better like and trust them! If the bid difference is minimal, I think it's better to go with the contractor you feel better about even if it costs are little more. 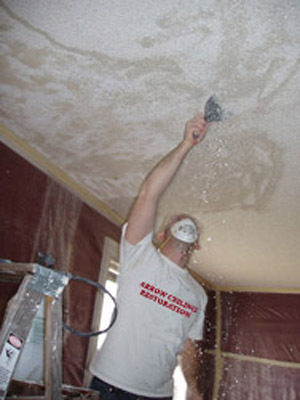 If you're looking for a Oldsmar Ceiling Contractor Specializing in Popcorn Ceiling Removal, Popcorn Ceiling Repair, Drywall Repair, and Texture Ceilings and Walls, contact Arrow Ceiling Restoration today at (727) 804-5411, or complete our estimate request form.